Visitors are invited to navigate the museum using five interactive stations located at various displays that, with the use of a tablet or Smartphone plus the app Junaio, come to life with stories, videos and photos. The stories, videos and images shared through the interactive technology are new and represent information Gronke “went above and beyond to find out about.” Over the course of four months, he shared that information with the design company, which put his ideas into action. Guests of the museum may now watch the Kahlenberg Engines in action, view a birds-eye video of Death’s Door shot by a drone, watch a scuba diver navigate an underwater experience, see the changing faces of the Berylune boat, and hear a 3D fisherman tell the true tale, “The Day the Combers Come In,” from Trygvie Jensen’s book, Through Waves and Gales Come Fishermen’s Tales. 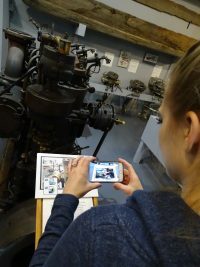 Guests are invited to borrow the museum’s tablets for free or use their own Smartphone or tablet to download the free app.